I have an unbalanced relationship with habanero chilis. I love the flavor, but they are simply way too hot for me to deal with let alone subject anyone else too. The problem is that they really are unique in their flavor and pretty hard to live without in the types of dishes that call for them, primarily dishes from the Caribbean and West Africa. The solution that I have adopted in dealing with these orange bundles of flaming flavor is to build a sauce that gets the flavor I want, and then use that in my cooking. 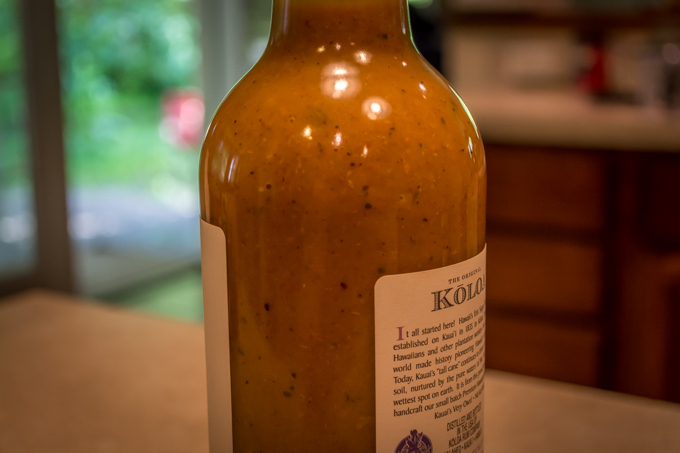 This sauce is one such example, although it contains a lot more flavors than just habanero. Here, cinnamon, allspice, and nutmeg provide a backdrop for the heat contributed by the crushed black pepper and the habanero. A little bit of rum and the tartness of cider vinegar finish off the flavor profile. In making this, I use pickled habaneros because, frankly, fresh ones frighten me. I think next time I make it, I will give the fresh ones a shot. When adding the chilies, simply adjust the number used to the upper limit of your heat tolerance. You want the sauce to be pretty hot and the heat from the habanero will settle down a little with time, so be a little more adventurous than you feel is prudent. Oh, make sure to be careful in handling the chilies. In fact, don’t handle them at all. They really are insanely hot and the juice, once it gets on your hands can play havoc with eyes and other sensitive areas. Remember, safety first….